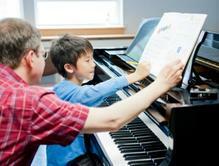 Limited openings for beginners, following a brief consultation. 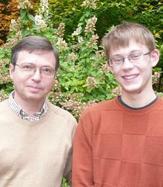 New January 2015: Mr. Odinokikh is also teaching at Franklin Pierce University. 2004 Winner of the Maria Clara Cullell International Piano Competition. Mr. Flores studied with Mr. Odinokikh for several years at the Conservatorio de las Rosas in Morelia, Mexico. Following receipt of his degree, Mr. Flores continued to seek out periodic coaching with Mr. Odinokikh on an individual, ad-hoc basis prior to winning the prestigious Cullell competition in 2004. 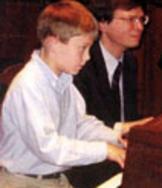 Above left: Vladimir with Miles early in his studies (before he started winning competitions). 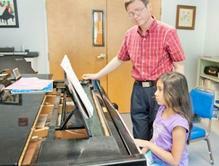 Mr. Odinokikh is pleased to be able to share here the successes of two of his more gifted students. Vladimir recognizes that not all students are destined or motivated to win competitions, but as a prize-winner himself, he understands how to support, nurture and motivate a student to achieve their full potential. Please scroll down to view videos of students Miles Walter (Keene, NH) and Luis Castro Flores (of Mexico). Please click here to view references for Vladimir as teacher.